Tourists locked out of The Temple Bar last year. AS YOU MAY have heard, the pubs will be open on Good Friday for the first time in nearly a century today. 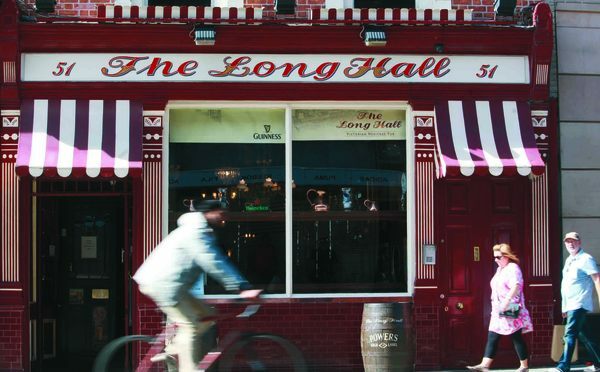 The ban on alcohol sales was overturned in the Dáil back in January and – with the exception of at least one town in Co Cork – publicans are preparing to throw the shutters open on a Good Friday for the first time since 1927. 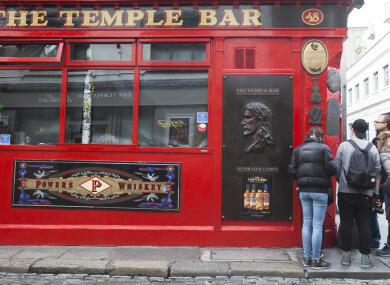 “I imagine a lot of people will be in and about town celebrating the uplift of the ban,” Mark O’Donoghue, proprietor of Slattery’s on Dublin’s Capel Street told TheJournal.ie. Slattery’s, one of a handful of pubs in the city still licensed to open its doors at 7am, will be one of the first hostelries open this morning. O’Donoghue says that while he won’t necessarily be expecting a horde of thirsty patrons to be waiting outside first thing, some customers have already been in contact to tell him they’ll be in at some stage later in the day. “I definitely feel that there’s going to be a vibe like in the run up to Christmas where everybody is celebrating,” the publican said. The Boar’s Head will also be opening at 7 – while John Geraghty of Publin.ie filled us in on a few eye-catching events taking place elsewhere around the city to mark the occasion. ’For Your Sins’, a new craft beer, is being launched by 5 Lamps Brewery at The Church bar off Jervis Street later today. And if your name happens to Jesus, Mary or Joseph, you’ll apparently be entitled to a free cocktail at the Adelphi on Abbey Street. At the official level, meanwhile, trade groups for pubs and restaurants are hailing the decision to allow alcohol sales as a major leap forward. Padraig Cribben, the Vintners Federation of Ireland chief, said he was glad that the Good Friday ban had been "consigned to history". The new approach was good news for business but even better news for visiting tourists, he said. That sentiment was echoed by the Restaurants Association of Ireland, which reported a "huge level of pre-bookings" for Good Friday amongst its members. Restaurants, the trade group added, "are happily catering for tourists that would like to have an alcoholic drink with their meal". The day will be worth an estimated €50 million to the hospitality sector, the RIA said. The Vintners pointed out that it would also generate over €7m in VAT and excise duty contributions to the exchequer from their sector. There'll be a few losers on the day too. Off-licences often did a booming trade in the run up to the traditional closing of the pubs - but any decline in sales this year will likely be counterbalanced by the fact that they're allowed stay open on Friday itself. Spare a thought though for the proprietors of train station pubs. Due to a loophole, Good Friday drinkers were entitled to a beverage at ports, airports and train stations once they held a valid ticket for travel. Pubs along rail lines, at least, won't be expecting that annual bonus today. As for whether there may be any changes to how companies in non-related sectors approach Good Friday in future, Neil McDonnell of business group ISME said he'd seen no indication of any change this year at least. "It always causes a bit of grief, because it isn't a bank holiday. What you will find is it will tend to be written into contracts of employment whether it's covered as a closed day or not," McDonnell said. Outside of the hospitality sector, he said, "businesses that normally shut on Good Friday will shut - I don't envisage that it would change the status quo from 2017". If you're trying to figure out whether your own local will be crowded or not - it looks like just under a fifth of the population are actually planning a pub visit. Responding to a poll carried out by Claire Byrne Live/Amárach Research for TheJournal.ie just 18% of respondents said they were planning to head to the pub today. A further 61% said they had no plans to do so, while 21% said they didn't know. In an effort to pre-empt some contributions to the comments section, we'll just add here that other pastimes are also available (and that many of them are healthier). Email “Good Friday: There'll be winners and losers as pubs open for the first time since 1927”. Feedback on “Good Friday: There'll be winners and losers as pubs open for the first time since 1927”.